These vibrant prints are anything but ordinary. There was a time when having wallpaper in your house meant an instant need for renovation. It came with a largely negative connotation, associated with dated styles from bygone eras, and the need to be swapped out for the oft less-offending alternative: paint. That has largely changed in recent years. Sure, older homes with wallpaper might need a bit of a revamp, but with so many incredible designers lending their talent to the realm of wall coverings and so many gorgeous designs available, wallpaper has never been chicer. Or, it turns out, offered in a slew of inspired styles. From the playful and vibrant to the demure and traditional, there’s a lot to love about the wallpaper options on the market right now. We’re narrowing down the pool by focusing on the picks that pull from some of the most ubiquitous trends in fashion right now. Here’s how they translate to wallpaper. Vibrant, punchy neon brightened the runways at Ashish, House of Holland, and Preen. It will do the same for your homes—add it in in big or small doses, accordingly. Fresh off one of the most exciting collaborations of 2018 (the Christene Barberich x The Inside partnership) comes a fun new wallpaper. Stripes of vivid orange balanced out by a soft pink will add a bold look to any room in your home. We love this one for the living room—a pattern like this deserves to be seen with regularity. This one’s a bit more playful, so try containing the neon print to a smaller area. Give an end table or cabinets a new lease on life by adhering the fruity pattern to the fronts, or make your workstation a bit cheerier by wallpapering the paneling behind your desk’s shelves. Bright yellow and lime green pack quite the punch. We saw a modern take on crochet that errs towards fisherman’s netting at Area, Louis Vuitton, and Oscar de la Renta, to name a few. Suffice it to say this cool material will be everywhere in coming seasons, so try it out to bring the look of texture to your walls. Clearly, the idea of translating crochet to your walls poses a technical problem—but you can still mimic the look. 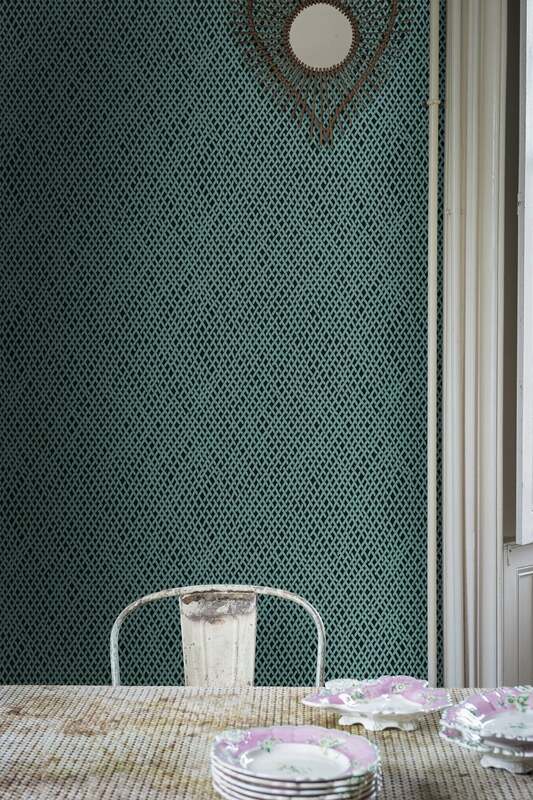 This Farrow & Ball wallpaper (available through Anthro in three cool-toned colorways) achieves the netting effect quite perfectly. Hand-illustrated by designer Molly Hatch, the draw for this paper lies in the intricate dealing. The mesmerizing crosshatch design provides a faux-texturized look to your walls; a stylish way to incorporate a bit of visual trickery into your space. Psychedelic tie-dye (R13, Collina Strada, Paco Rabanne) is a nod to the retro ‘70s resurgence we’re seeing in design at the moment. With a pattern as tricky to navigate as tie-dye, it’s best to go subtle. Michelle Mathis’ beautiful blueprint looks somewhere between tie-dye and watercolor. Use it in the place you go to relax or feel calm, like in your bedroom. This Calico print brings dyeing techniques to the forefront, magnifying the millisecond where dye touches fabric or water, forcing it to spread, into something eye-catching. Try it at home as an accent wall, or to bring life to a tiny bathroom. You saw this particular trend earlier this summer, but it looks like chic polka dots are here to stay. Jacquemus, Dolce & Gabbana, Regina Pyo had a few of our favorites. Spots in varying sizes are broken up by irregular dashes for a wallpaper that feels anything but one-dimensional. This playful print is perfect for the little one’s bedroom, where it can live up to its full potential as a whimsical, vibrant accent piece. Incorporating both a trendy print and a trendy color, this yellow spotted wallpaper is so simple it’s almost a neutral. It’s the ideal way for any die-hard minimalists to step out of their comfort zone and indulge in a pop of pattern.